Classic Vanilla fortune cookies hand-dipped in white chocolate decorated with a single red heart! Also available in milk and dark chocolate. These tasteful fortune cookies are personalized for your wedding favors, valentines or special event and are the hottest party favor this season! Fortune cookies are an original and fun idea for wedding favors. And our fortune cookies are baked fresh making them delicious too! Your friends and family will be impressed with your creativity as they read your one of a kind wedding fortunes. Whether you send them home with your guests as they depart, tastefully display them at place settings, or serve them as desserts, one thing is certain, your unique wedding favors will not be soon forgot! At FancyFortuneCookies.com all fortune cookie favors are baked fresh to order with the finest ingredients and hand dipped in your choice of milk, white or dark Belgian chocolate. We then decorate each cookie for you with a single red heart! Check out all our sprinkle options here. Each fortune cookie is individually wrapped in a clear cello bag. Cookies is a bakery!!! That means your order stays right here with us the whole time. Each cookie is individually packaged and sealed in a clear cello bag. For presentation ideas, check out our custom imprinted Chinese take-out containers. 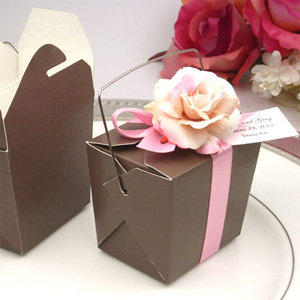 Place one or two fortune cookies in a clear or colored Chinese take out box for a fun packaging solution. The vanilla & dark chocolate fortune cookies were given as part of out wedding favors package. I received so many compliments on how those cookies were the highlights. It didnÃƒÂ¢Ã¢â€šÂ¬Ã¢â€žÂ¢t taste like typical fortune cookies but so much tastier & crispier. I would highly recommend ordering it...especially the vanilla flavor. My fiance and I ordered 3 different flavors of fortune cookies. These, chocolate covered cappuccino and vanilla chocolate covered. Fancy Fortune Cookies fulfilled my special request and packaged 3 cookies in little cello bags tied with a coral ribbon. The cookies were perfect, and I was very happy with the high level of service. I will definitely recommend it to friends!